The life of a touring entertainer is fraught with long hours on the road that can make one lose touch with any sense of place or home. While it’s quite common for most folks in the profession to take a break and recharge, some drop out of the life entirely as does the protagonist of Darlene Naponse’s feature Falls Around Her. Mary Birchbark (Tantoo Cardinal) has been bringing houses down from coast to coast for years with her guitar by her side. The performance that opens the film turns out to be her last however as she promptly leaves the stage and the venue as well to the utter bewilderment of her manager Keith (Rob Stewart). It turns out that she has decided to return home to her Northern Ontario reservation. Although warmly welcomed by old friends and family alike, Mary rarely ventures into town, preferring to focus on fixing up her lakeside cabin. Her sister Betty (Tina Keeper) can’t understand why she would give up on such a successful career while old flame Albert (Johnny Issaluk) struggles to re-connect which isn’t made any easier by his tenuous connections to a nearby mine which is responsible for arsenic in the local waterway. “All I wanna do is walk on the land” she laments as she begins to notice a series of strange disturbances around her home. She suspects it may be her old manager who has been writing and calling non-stop in order to get his meal ticket back on the road. Unsure whether Keith, an old grudge or her own mind is out to get her, Mary resolves and prepares to stand her ground and defend her new path, whatever may come to challenge her. 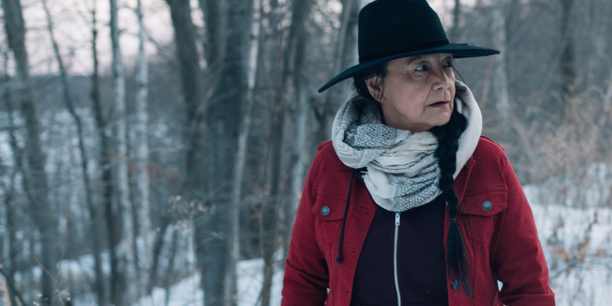 Much has been made about Falls Around Her being the first starring role for legendary Canadian Indigenous actress Tantoo Cardinal. This isn’t strictly true as she has been co-lead several times over her long career including a stunning turn in Loyalties (reviewed here). It is her first solo lead however and long overdue as she once again commands the screen from her first frame to her last. Even when nothing is being said, her expressions and body language speak volumes that rank with the best thespians the world has to offer. She has also found an excellent film to inhabit as writer/director Naponse weaves a compelling yarn of resilience in the face of past trauma and more contemporary pressures. Mary may have left one set of troubles behind with her retirement, but she has traded them in for new ones including family drama and mounting friction between industrial interests and her people. What ultimately takes centre stage though is the life Mary has built for herself and is living on her own terms. She is done being managed on the road and is now in a situation she can control. WhileFalls Around Her is first and foremost an indigenous story told through the lens of the people it portrays, it also speaks to the universal human experience of coming home and rediscovering your roots. It’s a fine story that’s well told, especially by its lead. Tantoo couldn’t have asked for a better career highlight.